Find your precinct and your polling place, so you know where to vote. Use the map below or enter your address on this website. To zoom in on the map, click here. Precinct 1: Gymnasium at the Tetonia LDS Church, 6181 South Main Street, Tetonia. Precincts 2 & 5: Commissioners Meeting Room. Teton County Courthouse, 150 Courthouse Drive, Driggs. Precincts 3 & 4: Driggs City Center, 60 South Main Street, Victor. Precincts 6 & 7: Gymnasium at the Victor LDS Church, 87 East Center Street, Victor. Once you know where to vote, go to your polling place on election day. On Tuesday, November 6th, cast your vote! Polling places will be open from 8am-8pm. Here is a sample ballot. You don't have to vote the entire ballot. To view larger, click here. We would be happy to answer your questions about the candidates or propositions. You can call or text Cindy at 208-313-3597 or Amy at 661-332-7722. You’re worried about what’s happening to Teton Valley. You see the cost of housing going up, and the opportunity for better paying, year-round jobs in the valley dwindling. You’re concerned about the traffic and the sloppy development. You fear that our wild spaces and farming and ranching culture could go by the wayside. You wonder if we’re destined to become the next Anytown, USA, with big box stores and no sense of community. When you think about spending your life in Teton Valley, you imagine great opportunities to thrive in our community. It might mean great paying jobs for you, top-notch education for your kids, or affordable housing options for your friends. You hope that the outdoor recreation and scenic views are protected...because that’s a big reason you’re here. You want to see Teton Valley become an even better place to live. I do, too. That's why I'm running for re-election. 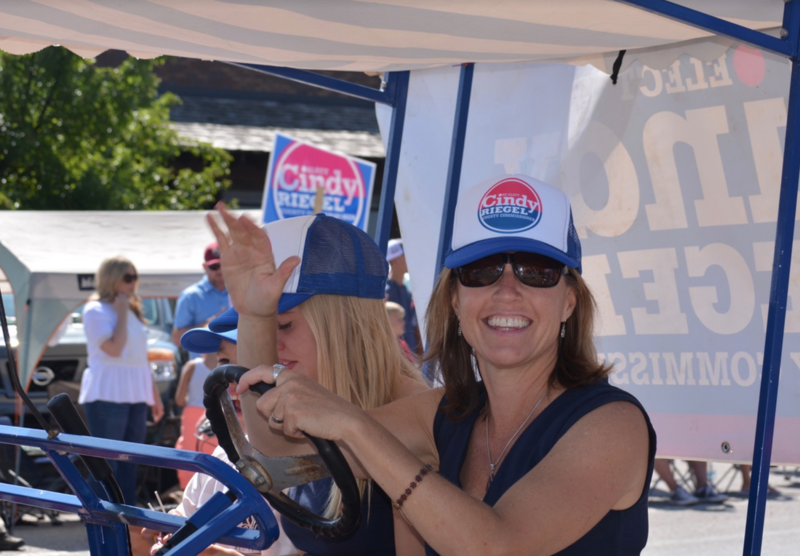 I'm Cindy Riegel and I've been serving as your County Commissioner since 2015. I am running for re-election because I care about this community and want to make sure we maintain what is unique and special about Teton Valley while growing in a smart, sustainable way. As development picks up again, we can’t afford to make the same mistakes of the past. We need visionary leaders willing to plan for our community’s future rather than sit back and watch Teton Valley get ruined. WHAT HAS CINDY DONE FOR ME?